The former Sunday Independent journalist has confirmed he is no longer with the party. RENUA’S DIRECTOR OF communications and political strategy John Drennan has quit the party in the wake of its disastrous general election result where it failed to win any seats. The former Sunday Independent political editor joined Renua in May of last year, saying the new political party had “the potential to bring real change to Irish politics”. 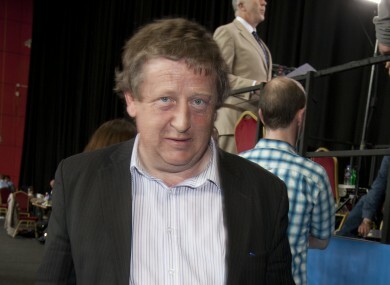 Drennan worked closely with party leader Lucinda Creighton throughout his time with the party, but it failed to capture the support of the public it had hoped for. Renua lost all three of its TDs in the general election with Creighton the most high-profile casualty in Dublin Bay South. It failed to win Dáil seats anywhere else despite fielding 26 candidates. It’s understood that Drennan handed in his notice on election day. Drennan is the author of a number of books, including The Great Betrayal: How the Government with the Largest Majority in the History of the Irish State Lost Its People, which was published while he was working for the party last year. Despite not winning any seats, Renua did secure over 2% of support nationally in the election which means it qualifies for state funding of around €250,000 annually. Creighton has said the party will continue despite not winning any Dáil seats. Under the party’s constitution she will have to resign as leader as she is no longer an elected politician. One of the party’s five sitting councillors is likely to take up the role. Email “Spin doctor John Drennan quits Renua after election failure ”. Feedback on “Spin doctor John Drennan quits Renua after election failure ”.